CommonLook PDF GlobalAccess can streamline the accessibility evaluation and repair of PDF files. It provides benefits over using Adobe Acrobat Professional or other tools to create, evaluate, and, if necessary, repair tagged PDFs. This article highlights some strengths and possible shortcomings of PDF GlobalAccess. For a tutorial on how to use this program, see the user guide on the CommonLook site. At the time of this review, a single-user license of CommonLook PDF GlobalAccess 5.1 Advanced Edition is priced at $1,688.70. Government and educational discounts are available, and annual licensing. While there is a Standard Edition available at a lower cost, most of the truly helpful features are only available in the Advanced Edition. This plug-in is only supported on Windows, and while it can work on files in any language, the software itself is only available in English. 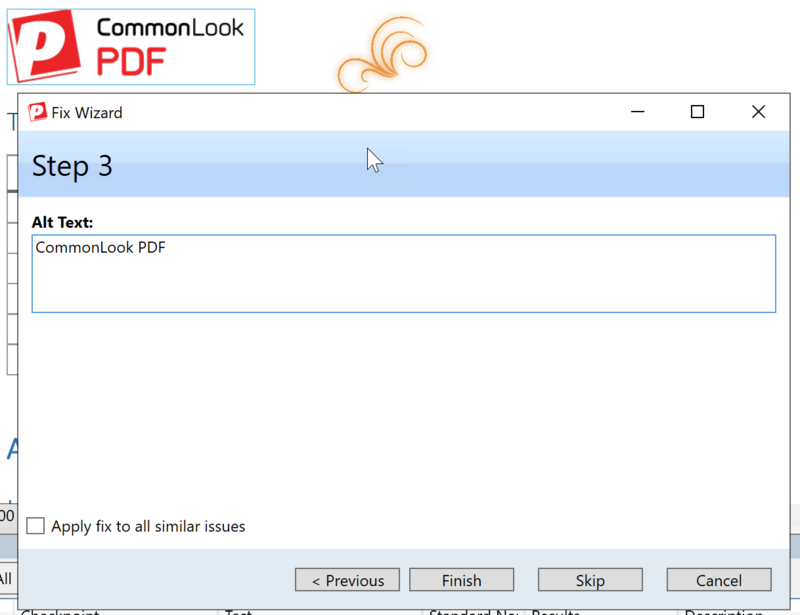 CommonLook also provides software to improve conversion of Word and PowerPoint files to PDF (CommonLook Office), and to evaluate and monitor PDF accessibility (CommonLook Clarity). These programs are not reviewed in this article. 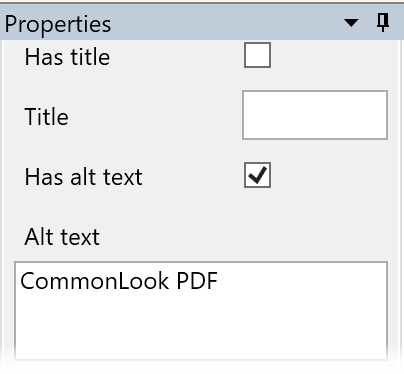 CommonLook PDF won't tag an untagged PDF. Untagged PDFs must first be tagged in Acrobat before using this tool. To run the CommonLook plugin, open Acrobat, open the desired PDF, then in the software menu select Plug-Ins > CommonLook > CommonLook PDF GlobalAccess. 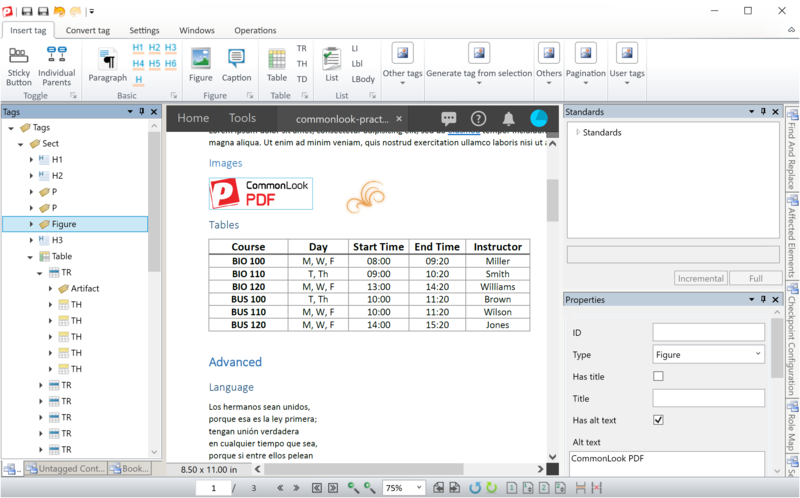 The tool's layout is similar to that found in Acrobat: menu options are presented at the top, tags on the left side, the PDF in the center, and other toolbars on the right. Most panels can be undocked and moved to another screen. Selecting a tag in the sidebar will highlight this option in the PDF, similar to Acrobat. Unlike Acrobat, selecting a block of text in the PDF will automatically select the corresponding tag or tags within the Tags sidebar, and will expand collapsed tags by default. Tag properties are always presented in the lower-right corner of the screen. This dialog presents helpful information that is often buried deep within the tag settings in Acrobat. Helpful properties include tag type, title text, alt text, header information for tables, and language information for multi-language PDFs. At the heart of this tool is the ability to evaluate the document's accessibility and then help the user address necessary issues. The software supports all relevant PDF accessibility standards including Section 508, WCAG 2.0, and PDF/UA. To begin evaluating the accessibility, select a standard from the Standards panel in the upper-right corner, and choose either Incremental or Full. Once a report type is selected, results are displayed in a table docked in the center of the screen, under the main window. Sometimes descriptions are hard to read without hovering over them and reading the mouse tooltip, but this isn't a major annoyance, and it can often be addressed by changing the table width, removing unnecessary columns, or undocking the table and viewing it on a second screen. The report is very thorough, sometimes bordering on overwhelming. Results can be sorted by clicking on a column header and extraneous information can be reduced by unchecking options in the Filter by menu. Most issues can be addressed by right-clicking the issue and selecting Fix. Some issues will be fixed automatically, but for most issues a dialog opens that presents a step-by-step "Fix Wizard" to walk you through fixing the issue. While evaluation to WCAG 2.0 is very good, if Checkpoints could be organized by WCAG 2.0 Success Criteria, instead of Guidelines, this would allow sorting by Level (A or AA) and linking to the W3C's PDF Techniques for WCAG 2.0. Interpreting accessibility standards and guidelines can be subjective, but there seem to be a few places where the WCAG rules are either overly strict or not accurate. For example, WCAG does not require correct heading levels until AAA (although it is best practice), and table summaries are not required at all, but not doing either of these is considered a "Failure" within the tool. Hovering and right-clicking on each issue can be a bit of a nuisance. Better keyboard accessibility within this section would be very helpful. Below are some features that make CommonLook PDF GlobalAccess stand out. Editing complex tables in Acrobat can be difficult and time consuming. PDF GlobalAccess has several valuable tools for working with tables. These are probably the most valuable features within the plugin. The Table Editor tool allows quick evaluation and repair of tables. 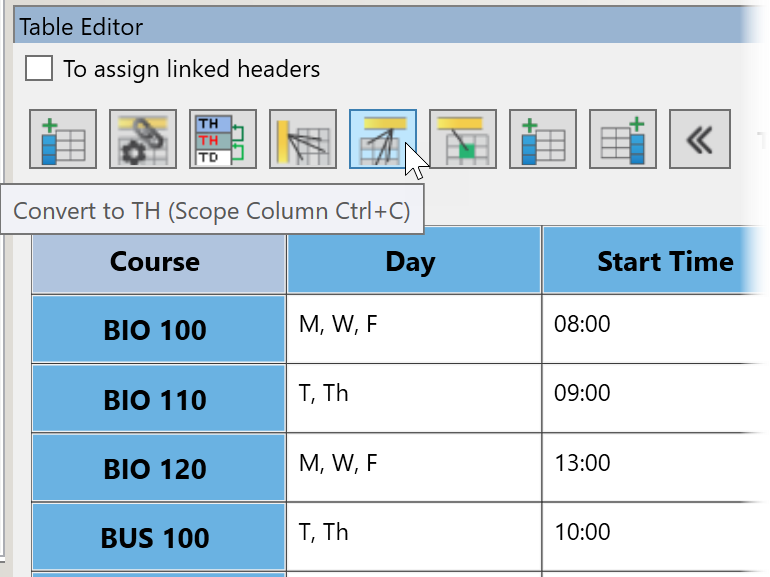 Features include the ability to specify column and row header scope, change header cells to data cells, and to assign or generate "linked headers" which can help make complex tables more screen reader friendly in some instances. There are also buttons to skip to the previous and next tables within the document. If a table is not tagged, or if the structure of a data table is very poor and needs to be recreated, the Generate Table option can be used to add the appropriate <TABLE>, <TR>, and <TD> tags. The Table Editor then must still be used to add the necessary header (<TH>) information. This feature does not always behave as expected, but can be a tremendous time saver. CommonLook includes options to linearize layout tables by row or by column, converting each cell into a <P> tag and removing extraneous table markup, a task that is very tedious in Acrobat. There is no tool to create lists within Acrobat. All tags must be added and manipulated within the tags panel. In CommonLook, a list can be quickly created by highlighting the block of text and then selecting the Generate List from Selection icon. A similar feature exists to add the correct tags to a table of contents. If a document contains a number of incorrectly-formatted headings, the first heading in need of repair can be selected then tagged with the correct heading level. Tag Similar can be used to apply the same heading level to all blocks of text with the same styling (e.g., the same size, color, and font). Merging, deleting, reordering, and changing the level of tags is easy - much easier than in Acrobat. Ability to Undo/Redo changes - an extremely important feature that is missing in Acrobat. A more accessible interface for users with disabilities than Acrobat (especially Acrobat XI and older). There is no way to review the PDF content order (displayed in the "Order" panel in Acrobat) or resolve a mismatch between the tags order and content order. This feature was available in older versions of this program, but it was removed because changing the content order can sometimes cause content to disappear from the screen (AKA "the z-order problem"). Some of the tools within Acrobat are more user-friendly, including the "Make Accessible" wizard, "Set Alternate Text" dialog, and the tools to create and edit fillable forms. It may be easier to use these tools within Acrobat before running this plugin. CommonLook PDF GlobalAccess is the most complete solution for PDF accessibility we are aware of at this time and can be a great time saver. If your budget cannot support the $1600+ price tag, or if your files only require simple repairs that are easy to do in Acrobat, then it might be overkill. However, if you deal with a significant volume of PDF files and can handle the up-front costs (both software cost and learning curve), this tool can definitely streamline the process of creating accessible PDF files. Disclosure: WebAIM was provided a copy of CommonLook PDF GlobalAccess for evaluation and demonstration purposes only.